Fundraising activities held to raise money for the National Centre for Inherited Metabolic Disorders (NCIMD) include; running marathons and taking part in other sporting events, charity fun nights, wedding favours, cake sales, raffles and lots of fun events. We have three specific funds to donate to, all of which benefit the children and young people who attend NCIMD. The metabolic play specialist uses this fund to purchase new toys and play equipment for the NCIMD. The world of play is forever changing and our patients deserve to have quality play experiences while in hospital or in clinic. Examples of this include: art and craft supplies, Xbox, iPads, portable DVD players and play equipment. The generousity of the donations to the Metabolic Play Fund allows us to host an annual Christmas party. This party recognises the hard work and challanges patients face during the year keeping to their diet. Continued fundraising will allow for us to update play facilities and play equipment. This fund benefits the NCIMD with ongoing projects and initiatives. In recent years it has been used to develop the health curriculum – a peer learning tool helping children to understand their condition through play. It has funded a series of story books about these rare conditions that are due to be launched soon. The apps for protein disorders will be completed later this year. The St. Brigid’s Ward Fund is being used to benefit those who attend the ward for investigations and long term stays. These funds are currently being used to update parent mattresses with sleepchairs. 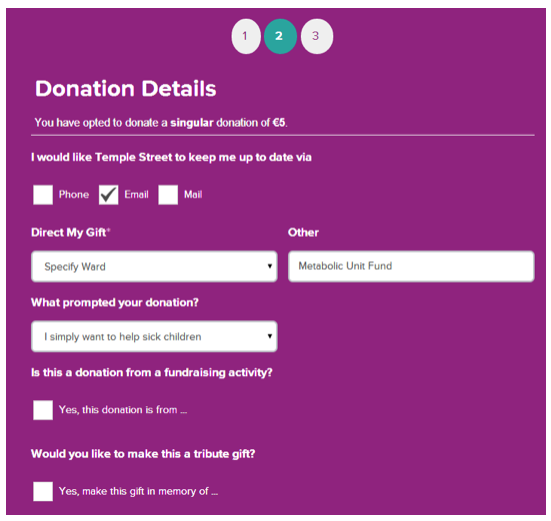 When entering your donation details on www,templestreet.ie, under ‘Direct my Gift’, specify ward and then type in one of the above funds. Many thanks for your on going and continued support.